2. 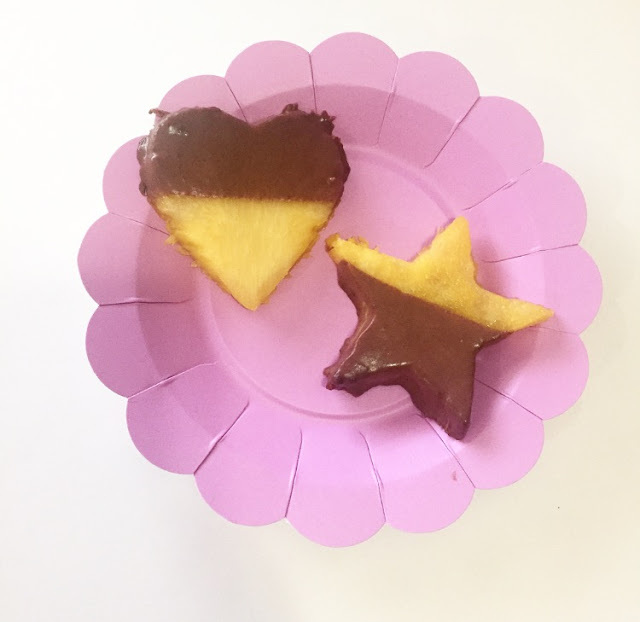 Put your slices on a plate and begin cutting out pieces with the 'cookie cutter' of your choice (This step is totally optional, but I just thought it was super adorable; you could also just cut them evenly into smaller slices that are easy to dip too! 3. Now for the chocolate mixture (fondue). Pre-heat your stove to low-medium heat and add 1 cup of your "half and half". Let it simmer for 4-5 mins. 4. Next, add your chocolate chips! And continue to stir until the chips melt in the 'half and half' mixture. The consistancy should be like a "soup" at first! 5. When you're sure the chocolate chips have melted, turn off the heat! Remember, You don't want them to burn, so if you smell something burning, you know you left it for too long. LOL. 6. Pour mixture into ceramic bowl to keep it warm, and let it sit for at least 8-10 mins so it gets slightly thick. Thick enough to stay on your pineapple when you dip (or whatever fruit/treat your heart desires!). You like posts like this?! Mmm. I love fresh pineapple and chocolate. Guess what I will be making this weekend. Ummm why did I never think of doing this myself?! Such a great snack!! Can't wait to try it! Thanks for stopping by :) ....I hope you do try it out..let me know, I would love to know how it turns out !! !